Memories and experiences of childhood become imprinted on the consciousness in a permanent way. Seeing toys we played with, pictures we drew, and characters that were real or imaginary give us a sense of nostalgia. “Child’s Play” is an international, all-media exhibition celebrating the child within. The concept of this show is to revisit childlike ideas, behaviors, symbols, and imagery to bring some whimsy and childlike innocence into our adult lives. Melissa Whitwam and Natalie Tucker talk Child’s Play with Show Me St. Louis! submit up to three works for a non-refundable fee of $24. Tim Liddy’s painted constructions so closely resemble their board game inspirations that many viewers walk right past, thinking they must be found objects. Liddy relishes the confusion. The works are actually elaborately enameled copper sculptures, each seemingly printed word and every abraded strip of masking tape made by the artist. Once you’ve discovered the truth, you are caught up in the astonishing detail and verisimilitude, and you’re drawn in to investigate more closely. 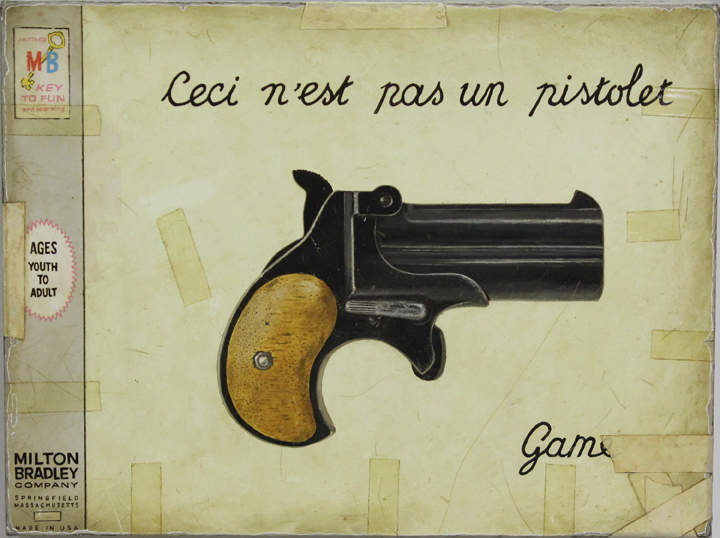 Within the recognizable format of a mid-twentieth-century game box are surprising elements that are often at odds with the traditional object. Liddy inserts wry commentary on mid-century social mores into this comfortably recognizable context. The fact that the boxes seem to be held together tenuously by tape suggests the rapidly eroding conventions of an earlier era.